Working with a fully licensed and insured roofer, Maryland, is the safest and smartest way to improve your home. If you hire a contractor that is not licensed or insured, you could be paying for costly mistakes out of your own pocket. DryTech Roofing is the fully licensed and insured roofing company in Maryland that homeowners have turned to for dependable roofs and quality service since 2000. 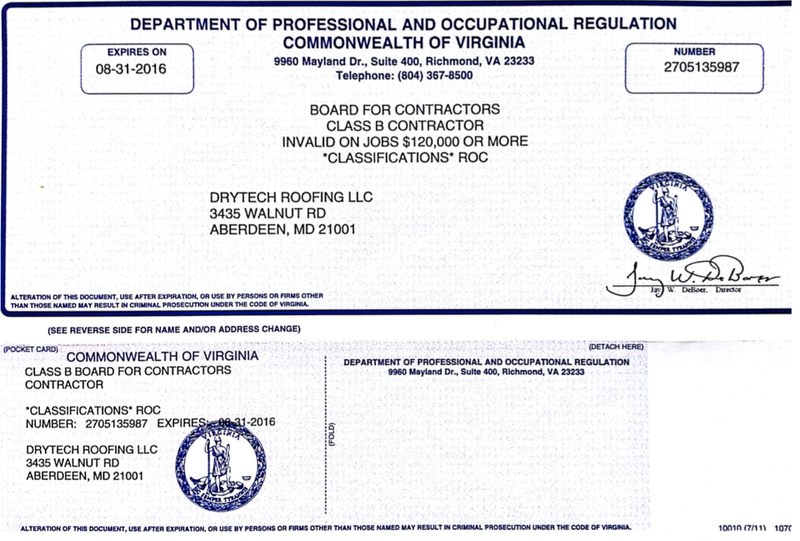 Fully Licensed- DryTech Roofing is a licensed roofer in both Maryland (#05-128626) and Virginia (2705 135987). Fully insured – We carry both Worker’s Compensation coverage and $2 million in liability coverage to protect you and your home. Few Maryland roofers can offer the same kind of protection that you get when you hire DryTech Roofing, Maryland. Hiring a Maryland roofer without this insurance coverage and having an accident occur on your property can lead to disaster. YOU may be held responsible for any damages or mistakes, and you could be paying down the road! Make sure you ask for proof of license and insurance from any roofing company in Maryland that you get an estimate from. Or let us offer a more simple solution: Give DryTech Roofing a call, and hire the fully licensed and insured Maryland roofing company that local homeowners turn to for honesty and integrity.